Myself and my partner Keith have many happy memories of our holidays in France just getting in the car and driving to where ever we wanted that’s how we came to find the wonderful Limousin area. 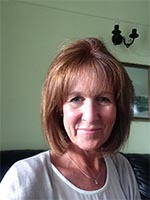 We both had very busy full time jobs in the UK but life was very hectic and we had no time for ourselves so we decided that we wanted to live in France with its quieter simple pace of life. We sold our house in England and in May 2016 we packed both our cars and along with our three dogs we set off for France ! We bought our new home with a barn and just under an acre of land which has enabled us to accommodate our love of animals and we now have five dogs one cat various chickens, ducks, goats and sheep. Our neighbours have made us feel very welcome and we have integrated very well into village life. All in all we have settled well into the French way of life we are still working on our house which is an ongoing project. I had done a little work in Estate Agency in the UK and decided that I would love to help people find their dream home here in France just like we have. It is a beautiful part of the world with its lovely scenery lakes and mountains and I would love to help you start your new life in France. This house is in a wonderful secluded location by the river with its natural waterfall and . . .
Rambling 5 bedroomed character property with beautiful garden views. 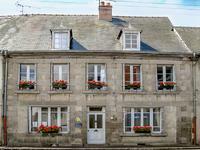 Separate annex accommodation for guests and only 15 minutes from historic Aubusson. This substantial and authentic property is within a picturesque hamlet and ideal for those . . . Substantial and characterful detached stone property consisting of 2 independent houses with gardens, land and barn set in a spectacular country environment. A rare find. Located between Chenerailles and historic Aubusson, world famous for its . . .
Large spacious detached family house with five bedrooms and four bathrooms situated in an elevated position overlooking the historical town of Aubusson. One in a million view! Breathtaking position. Priced to sell. A spectacularly positioned and renovated house with surrounding established gardens leading . 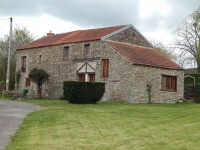 . .
Detached 3 bedroomed Barn conversion, easily maintained gardens & separate cottage, walking distance village, Creuse. 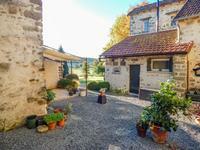 Originally a Creusoise stone barn, now fully renovated and converted to a spacious and . . . Very well presented spacious house with attached barn and workshop situated in a quiet hamlet surrounded by beautiful rolling countryside. This house has been fully renovated by the present owners and is situated in a small hamlet . . .
Beautiful renovated stone house, 3 bedrooms, barn and garage, garden, stunning countryside views. Hamlet location. Beautifully renovated 3 bedroomed stone house. Situated in a small hamlet with stunning views . . . This house is situated in a small rural village and has a further two bedroom house for . . . Located in Auzances. Traditional and character 3 bedroomed townhouse with attached shop and courtyard plus separate plot of land at 700m. A traditional 3 bedroomed townhouse with an attached commercial shopfront set in a small . . . Located in Chenerailles. Charming, spacious French townhouse, 5 beds, 5 bathrooms, pretty courtyard garden, in the past run as a B&B. Built in the early part of 1800 this property is located right in the heart of a thriving . . . 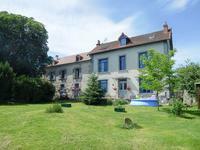 Situated in a small hamlet just 6km from the town of Auzances with all local amenities . . . Located near Ahun. Pretty 3 bedroomed cottage, outhouses and wooden cabin. Located in a quiet hamlet in the middle of the countryside. This traditional 3 bedroomed cottage is located in the heart of the countryside in a quiet . 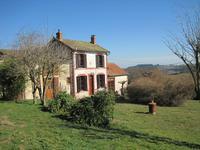 . .
Lovely character cottage in riverside location in the heart of Aubusson. Three bedrooms, kitchen, living room, shower room. 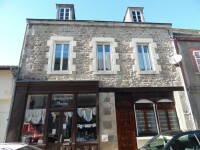 Three bedroom cottage situated in the historic old quarter of Aubusson in a beautiful . . .
Three-storey, character village property extensively and sympathetically renovated with separate good-sized garden. Set in a village location, this property is ready to move in to. It is comfortable, . . . 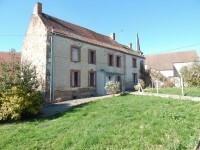 Authentic property to renovate, formerly the village cafe, in a charming location with large barn and garden. 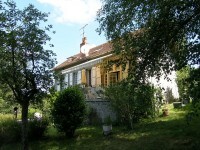 This property to renovate is located in a village close to Evaux-les-Bains which is renowned . . . Located in the village of Mainsat. Town House with six bedrooms formerly the Boulangerie. 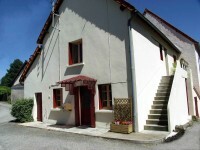 Village house with six bedrooms formerly the Boulangerie situated in the centre of Mainsat . . . Excellent opportunity to acquire two adjoining houses situated in a beautiful rural location with ample potential. Two adjoining houses in a rural location with views over open countryside close to the . . .
End of Terrace House situated in the centre of Bellegarde-en-Marche within walking distance of the local amenities yet only a short drive to the larger town of Aubusson.